The Violator is one of the smallest of the Serpentis vessels. 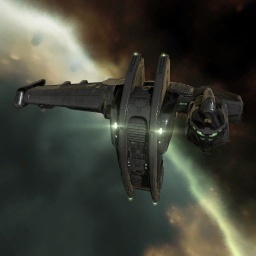 Its design was unceremoniously stolen from the Gallente, though its inner workings have been adapted to fit the piratical lifestyle of the Serpentis: In addition to its excellent hybrid damage, it is capable of webbing its opponents and holding them down for a further beating. The Violator is the Serpentis corvette (corvettes were formerly called rookie ships). This ship was given as a promo at Pax East 2013. Further information about additional or recommended skills to pilot Violator for a specific or it's common role(s) can be written here. No sub-article about Reaper roles or piloting tactics. You can write them here. This page was last modified on 11 March 2019, at 16:13. This page has been accessed 25,203 times.